This monument in Scotland honors William Wallace. The truth about William Wallace does not lie in the motion picture “Braveheart,” although all credit should be given to the film itself as a successful movie. On the down side its lavish artistic license and wildly inaccurate historical facts and portrayals make it pure fiction. However it does convey some sense of patriotism, the general idea of who William Wallace was and the suffering of the brutal times in which he lived. The term “Braveheart” was originally coined for Robert The Bruce, whose heart was removed after death and taken on crusade, although it has been applied to Wallace in the movie. In fact the makers of “Braveheart” needed the artistic licence in order to make a movie about William Wallace because so little is known about him. In the 15th Century a writer and poet called “Blind Harry” wrote a poem called “Acts and Deeds of Sir William Wallace, Knight of Elderslie.” For a long time people looked at the works of “Blind Harry” as if he personally knew William Wallace. However nearly 200 years had passed before the poem was penned. Just like Hollywood, Blind Harry had artistic licence and needed so for his work. The little we do know for certain comes from church records, official crown records and other documented evidence of the time. Scotland is an old country and it is easy to forget the timespan of the history involved. William Wallace lived seven hundred years ago in a world which was very different to the world we know today. Born sometime around 1270, during the reign of King Alexander, it is known he had two brothers, John and Malcolm Wallace. The depiction of a bowman on a recently discovered seal may suggest this as a background for his family. The seal suggests his father’s name may have been Alan, although this is far from certain. The place he was born is also unknown and both Elderslie in Renfrewshire and Ellerslie in Ayrshire claim the title, although there is no supporting evidence for either place. What we do know is that William Wallace was born into one of the most brutal and turbulent times in the history of Scotland. 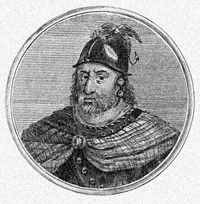 At the time of Wallace’s birth, King Alexander ruled successfully in Scotland and although he was a brutal man in his own right, his reign was one of stability and security. He maintained a professional relationship with England, prevented any English claims to Scottish lands, provided security and stopped English military forays into Scotland. However an event occurred that would change the history of Scotland forever. To understand William Wallace, who he was and the world he lived in, it is vital to understand the series of events that happened next. For it is these events that placed William Wallace in the position he gained, and secured him a place in Scotland’s history.